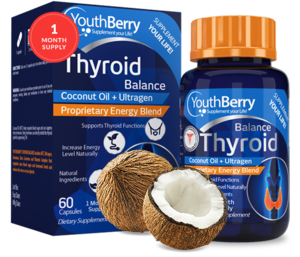 YouthBerry’s Thyroid Balance is a potent blend of Coconut Oil &amp;amp; Ultragen. This supplement supports thyroid functions while naturally increasing the energy levels. Coconut Oil (MCT) helps regulate blood sugar and can suppress stress hormones, which can directly inhibit the thyroid gland. 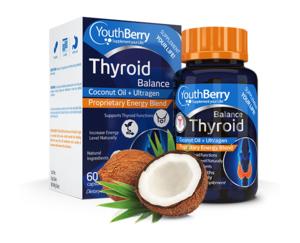 YouthBerry’s Thyroid Balance includes MCT, Ultragen, Selenium, Beta Carotene and vitamin complex, which regulates your blood sugar and hormonal levels while reducing the stress on your glands.